Is my US address a legitimate US Shipping address? Foreignshopper.com provides all our members with a real US street address, and unique suite # for their purchases in the US. The suite # is also your Client ID #. Will you accept shipments sent to me by online merchants and individuals? What couriers do you use to ship my merchandise & packages? Foreignshopper.com gives our Platinum, and Business members complete flexibility with their shipment schedule. Shipping preferences can be chosen at the time of foreignshopper.com membership sign up process. Shipping preferences can be changed online at any time. I want to order several items from different merchants, and I want them all sent together. Can you repackage these items into one box? Yes, we can consolidate all your packages into one shipment by repackaging. Depending on your membership level, repackaging service charges will apply. Click here for details. Can I send gifts to my family and friends in other countries? Yes. We can send your packages to anywhere in the world. Shipping charges may vary based on the destination country. Click here to see what is available with your plan. What does it cost to obtain a Foreignshopper.com membership? How do I pay the shipping charges? We accept credit cards < Visa, MasterCard, Discover, & Diner’s club>. We charge your credit card on file with Foreignshopper.com as your merchandise is shipped. Any changes to your payment methods must be made prior to your next shipment. Your yearly membership fee is automatically charged to your credit card on your renewal date. Please contact us for any changes to your yearly membership fee in advance. Where do I send payment by Check or Money Order? How I do order from U.S. companies that do not accept international Credit Cards? Once you receive your Foreignshopper.com address, contact your credit card company and add your Foreignshoppper.com address as your secondary address. Now that you set up your Foreignshopper.com address, you will be able to make purchases from US retailers, since your records match that of the Credit Card Companies. All credit card companies should allow you to add a secondary address. As a Foreignshopper.com member, you can also enjoy the convenience of our Personal Shopper service to purchase from U.S. retailers. With our Personal Shopper, you have the convenience of allowing us to pay for your merchandise and we then charge your credit card for the purchase you made through Personal Shoppers. How does Personal shopper work? Once you’ve become a member, you’d key in the details of your purchase requirements. Our specialist will take that information and purchase the goods, as per your requirements. Do the foreignshopper.com shipping rates include customs fees, tariffs, or taxes? The published Foreignshopper.com shipping rates includes receiving your packages and delivering internationally from our warehouse to your address. There may be additional import fees or duties depending on the purchases you made in the US and being shipped into your country. These fees vary from country to country and they are not covered by Foreignshopper.com. Please contact your local customs office for more information on duties or import fees. Yes! You can buy from any US retailers or individuals not listed on our Shopping page. I want to buy merchandise on eBay but many of the sellers won't accept credit cards. Can you send them a check or money order for me? Yes, you can use our Personal Shopper services. Click here for more details. How does my online account work? Your Foreignshopper.com is a 24/7 online account. You can access any time. In addition you will also receive an e-mail notification of the same. Can I obtain a Foreignshopper.com account for my Business or company? Yes! For Business plan accounts, an officer of the company must sign the USPS Form 1583. Also, a photocopy of picture ID for that person must accompany the form. Do you offer addresses in other states? How can I ensure I get all package notifications? Foreignshopper.com sends email alerts about your packages received at our warehouse, consolidation, delivery notifications and other important alerts if any. Sign in to Foreignshopper.com “My Account”, click here to view ‘My Account’. Follow the page instructions. How can I receive my online purchases at my address using Foreignshoppers.com services? Do I need to submit USPS Form 1583? The USPS Form 1583 is required for all customers that are on our mail forwarding services and receive USPS mail. Where can I find USPS Form 1583? Is a "Signature of Agent/Notary Public" required on form 1583? No, this is an optional field on the form. Do I have to send this form 1583 each time I receive a package from USPS to your warehouse? How is the Form 1583 filled out for a corporation? 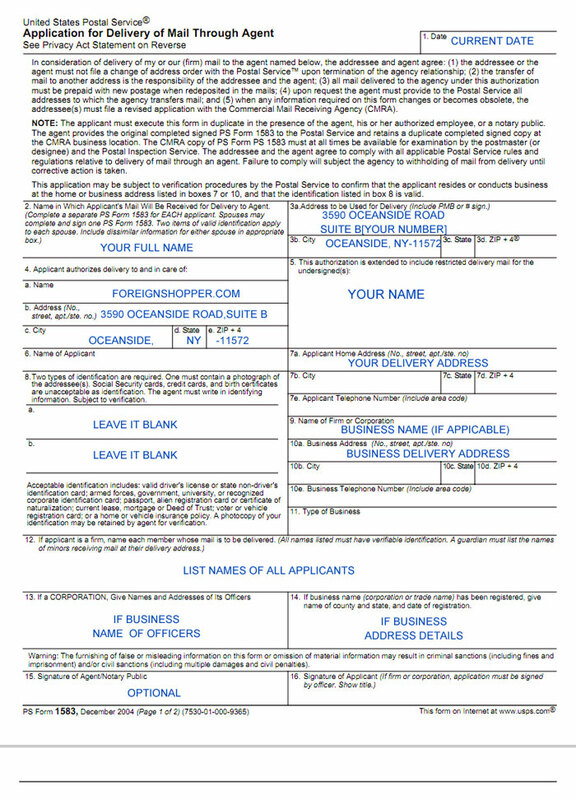 The USPS Form 1583 must be signed by an officer of the company and a photocopied picture ID for that person must accompany the form. How can I be assured of fragile Items that I ordered online and shipped through Foreignshopper.com? How does imaging service work? Is there an additional fee involved? Do you check for damages when my merchandise arrives at your warehouse? Will my Membership automatically expire?